As a recruiter, it might sometimes feel like Facebook is actively working to make life difficult. Organic reach is harder than ever to come by, and companies that don’t follow fairly detailed best practices when posting and advertising in order to spread their employer brand are often penalized severely. 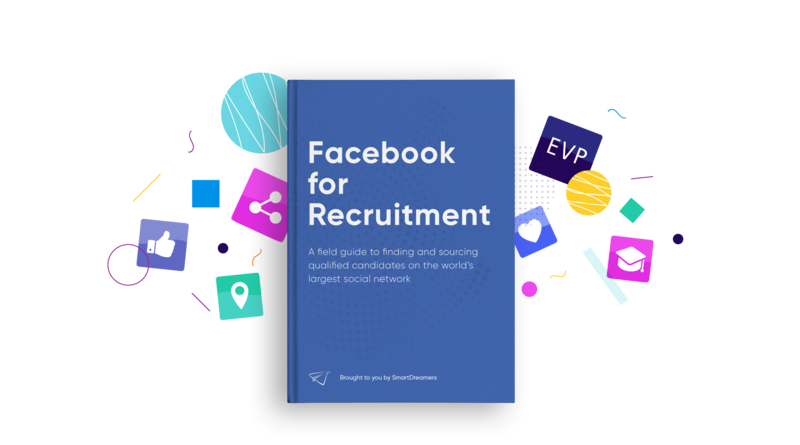 At the same time, the sheer size and scope of Facebook as a platform makes it hard for recruiters to ignore. If you’re going after passive job candidates (and you really should be), you’re fairly likely to find that your target personas are already daily or monthly Facebook users. Recruiters need to be prepared to meet and overcome a number of hurdles in order to recruit effectively on this platform. The first hurdle you’ll need to overcome, and certainly one of the platform’s most talked about aspects from a business perspective, is Facebook’s infamous algorithm. This is the program they use to determine which users see which posts at which times, and Facebook is constantly tweaking it to improve (or at least change) the overall user experience. Businesses often decry these changes—usually with good reason. New changes generally make it more difficult for businesses to get organic reach. As a recruiter, this means fewer impressions and thus fewer clicks, applications, and hires. So, the question becomes: how do you make sure that your target personas are seeing your messaging and getting the chance to engage with your employer brand? First of all, you’ll need to create high-quality content that’s highly relevant to your audience; by creating the sort of content that users will engage with, you increase the likelihood that it will spread across newsfeeds organically. More practically speaking, however, you’ll almost certainly want to develop a strategy that combines your organic reach with paid advertising. By boosting posts, creating sponsored posts, and placing banner ads you can bolster the impact of your other content and make darn sure that your target personas encounter your brand. In the hurdle above, we breezed past the idea that success on Facebook is largely based on your ability to make high-quality, highly-relevant content. Let’s back up a minute and think about what that really means. The key with all social media, Facebook especially, is to focus on providing value for your audience. For some businesses, there are fairly obvious ways to do this. A magazine or other publication might curate a selection of interesting articles each day on its Facebook page. By the same logic, an airline might offer helpful travel tips. When it comes to recruiting, there doesn’t seem to be an obvious parallel. Thus, for many businesses, finding a real way to add value can become a real stumbling block. In point of fact, however, recruiters can add value for their audience by providing them with information about the hiring process. Towards the top of the funnel, this might be generalized tips for getting a job in your particular industry, but as you begin to target second- and third-touch interactions with candidates in your recruitment pipeline, you can truly delight them by keeping them informed on exactly what type of candidate you’re looking for, exactly what value your company can offer employees (i.e. your EVP), and exactly how to apply. By offering concrete, usable information in this way, you help to create the type of content that users appreciate and engage with—making your audience more inclined to think of your company as an employment destination. Okay, we’ve gotten the two big ones out of the way—now we can get deeper into the nitty gritty of the difficulties businesses encounter when recruiting on Facebook. For instance: consistency. Too many Facebook pages fail to see returns on their efforts because they are posting inconsistently, with flurries of activity punctuated by periods of silence. Studies show that those who post regularly (every day, or even multiple times a day) see better reach and engagement over time than those who don’t—and roughly the same reasoning applies to advertising, which should also be done on a consistent basis. Achieving this level of consistency without, for instance, a dedicated social media person can be difficult, but there are tools out there that can make it easier. Recruiting success on Facebook is, in large part, about providing your audience with content that it wants to engage with. But what you should be asking, as you try to accomplish this, is: which audience? If you’re managing a corporate Facebook page, you might be attempting to reach a number of different audiences all at once, e.g. potential customers and potential recruits. Even if you’ve already segmented your Facebook presence into separate recruitment marketing and traditional marketing pages, you’re still faced with at least two distinct groups that you’re trying to speak to: active and passive job-seekers. This might not seem like it would present too much difficulty, it seems simple enough to create some content for one group and different content for another. Unfortunately, this can have negative implications within the context of Facebook’s algorithm. Thus, if you’re trying to reach a subgroup within your audience, Facebook will penalize your content for not being sufficiently relevant to the other segments of your audience. This is why it’s so imperative to have a separate careers page, and it’s also why Facebook ads are such a powerful tool. Because their ad targeting options let you specify your target users in extremely granular detail, they’re a great way to get broad reach for content that might otherwise be deemed (largely) irrelevant. Let’s say your Facebook page is firing on all cylinders, your getting tons of organic and paid reach and your engagement numbers look good. But your total job applications don't seem to be on the rise at all. What gives? Possibly, you aren’t maximizing conversion opportunities within your content. In order to turn your reach into tangible recruiting success, each ad that’s directly advertising a job opening needs to have a clear call-to-action that links to a landing page particular to that job. If you direct every job ad to a general careers page, you’re likely to turn off the pickiest (i.e. the most in-demand) applicants. For posts and ads that are not directly aimed at filling a particular post, you should have the same sort of direct call-to-action in place, but it should be aimed at getting users to enter your recruitment funnel in some other meaningful way (signing up for an e-mail recruitment newsletter, for instance). In doing so, you ensure that the users who are gaining value from your content are able to return the favor with a minimum of fuss.